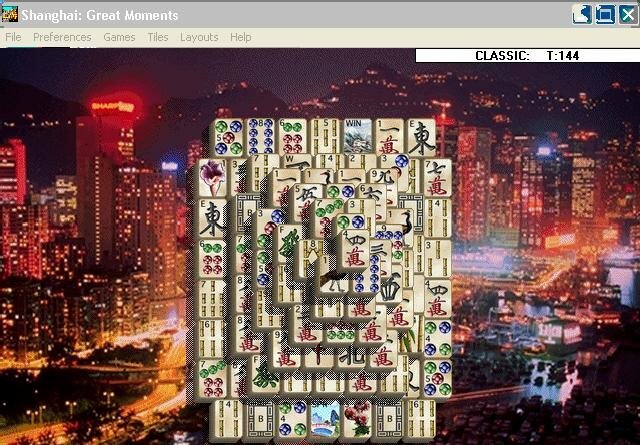 Shanghai: Great Moments is basic matching tiles mahjongg that comes on CD-ROM. There’s a good amount of digitized video in this package and other multimedia. 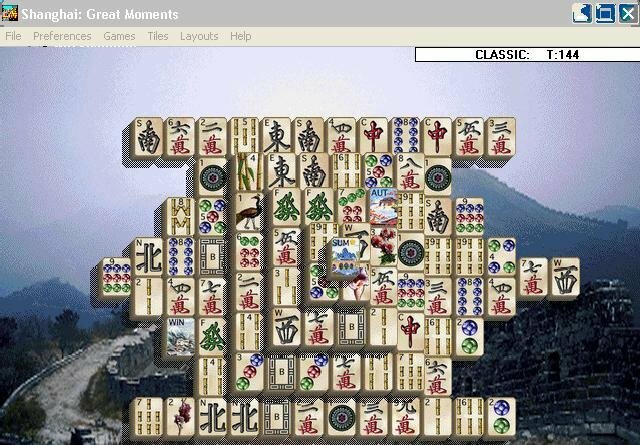 It includes nine different sets of tiles to offer the player some visual variety. 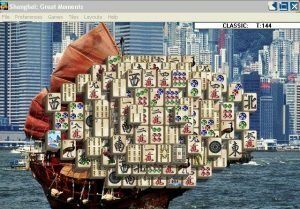 The standard mahjongg tile set is included, along with sets with the themes of space exploration, science fiction, romance, art, famous people, music, inventions, and historic events. 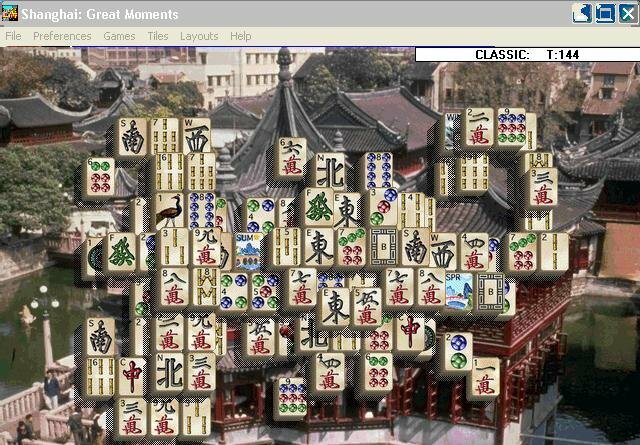 The art of these tiles is far superior to any other mahjongg game, with the tiles of recent events and people being almost photo-realistic. 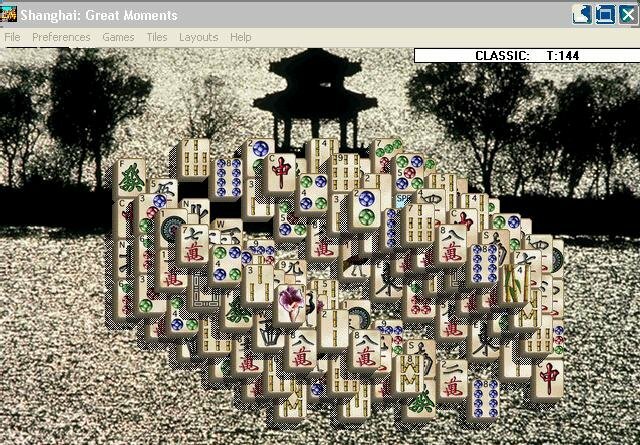 When you match a pair of tiles, a short animation appears on screen as a reward. These are mostly hand-drawn art (and very pretty, too), but some tiles reward you with a short video clip. 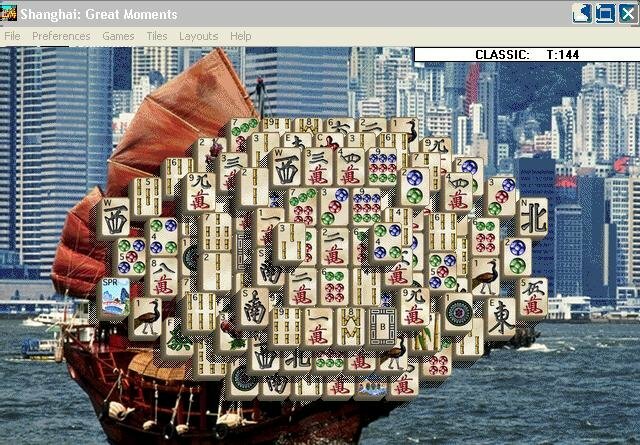 Shanghai: Great Moments contains some interesting variants on the standard game of mahjongg. 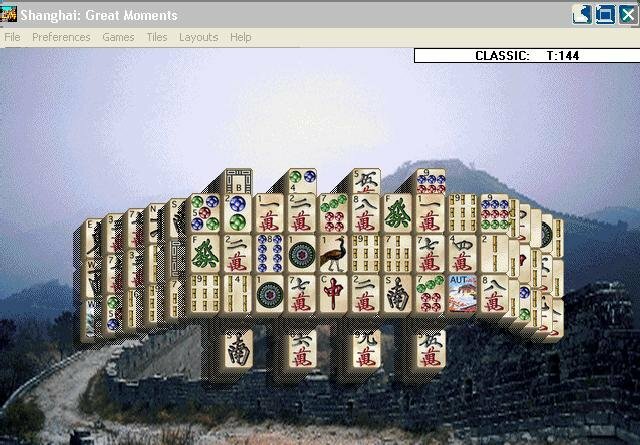 In the game “Great Wall” the on-screen tiles come under the effect of gravity; if you create an empty space beneath a tile, that column will fall down until its path is blocked. 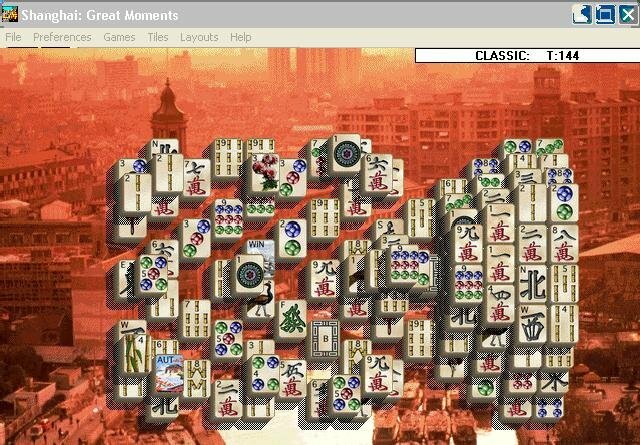 The game “Action Shanghai” challenges your nerves by giving you the task of removing a half-sized layout (72 of the standard 144 tiles) while the computer adds additional tiles every few seconds. 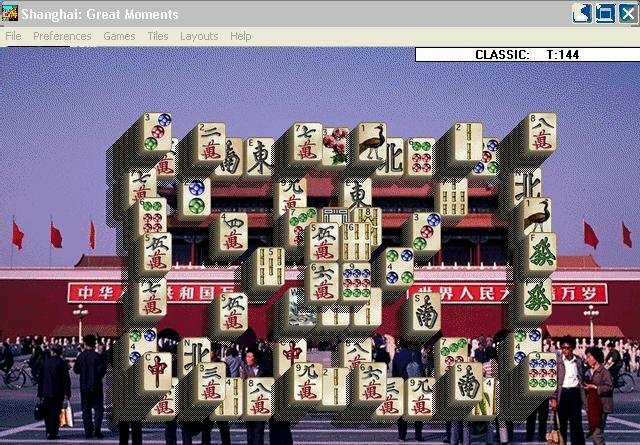 “Beijing” is an interesting variant, combining mahjongg with a sliding puzzle game. 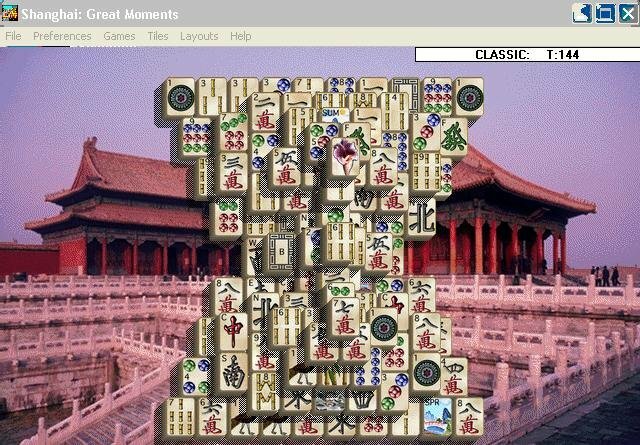 Here you can match tiles by clicking on “open” tiles, or by sliding rows and columns of tiles in all four directions (provided you have some blank space to slide into, of course), which can lead to more than one match in a single move (big points). 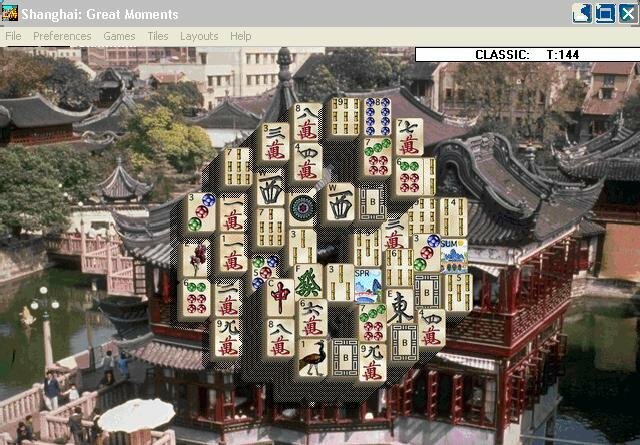 There are also two-player and tournament versions of the classic Shanghai game, which combined with the 13 different tile layouts should provide enough variety to keep players happily wasting time.